In late October 2015, I traveled to Peru, the most global southern and highest altitude destination of my life thus far. I was going to fulfill the role of interpreter for sisters from the US as we formed part of a delegation representing the US chapter of the World March of Women at the Americas Regional Encuentro. This is a reflection in-progress on only a sliver of my experiences. My flight from San Antonio, Texas had a layover in Mexico City. 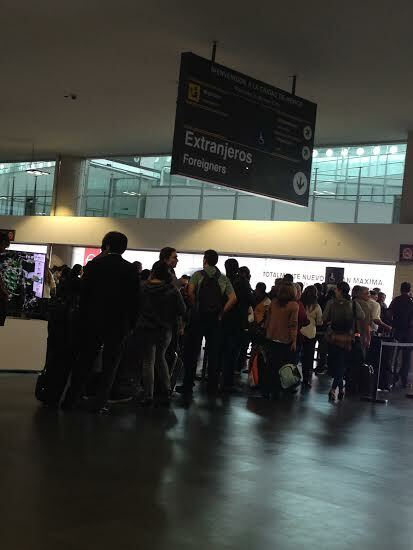 As i entered the Mexican airport, I was met with 2 giant ceiling signs directing me to a line: “Residentes” (residents) and “Extranjeros” (foreigners). I was stumped for a few seconds and had no idea which line I belonged to. I started to rationalize “Extranjeros” to alleviate the sting of resigning to walk towards that line....maybe they meant extranjeros as in “return residents”, or “out of town residents”, or even “lost and found”? Anything but extranjeros, I thought. So, I got in “my” line. I watched a video that played on a loop on four plasma screens visible from any position in the Extranjeros line. It was a promotion for a program that returns people deported from the US to Mexico. The video included interviews with men talking about how well and mercifully they were treated at some house where they were given a meal and allowed a good night’s sleep before they continued their journey to either make their life there (I forget what city this center is in) or to move onward, back to their homeland. It was a strange video to take in there. Over 100 travelers stood in that winding line where cell phone use was prohibited and I didn’t see a single other person paying any attention to the video. As I waited, I thought about my relationship with Mexico, and Latin America. Just after I was born, my mom returned to where she was born. For about a year, my dad visited me and my mom in Mexico City every weekend with a suitcase full of Gerber baby food from the US because he didn’t trust local grocery stores. Throughout my life, my mom thought it was so ironic that they went to so much trouble to establish my US citizenship as an infant, and as a child, adolescent, and adult, i’ve always wanted to go back and live there. For many years of our childhood, my sister and I had a hilarious time with our parents on summer road trips to Mexico City and surrounding areas visiting my mom’s family. The Mexico-Texas border has always been pretty blurred for us –pronounced, yet blurred. I finally got through the line at the airport and onto the “other side” -the side that is directly connected to the rest of the world; the air feels immediately different from the air of the line. My uncle and my cousin and her beautiful babies met me with open arms and laughs and love. My layover was several hours so we went to hang out at their nearby home. My other uncle and my cousin met us and we proceeded to reminisce and eat, and eat. My uncle the mouthy one scolded my other uncle's family for calling one of the babies, "prieta". He claims she's not so they shouldn't call her that. Prieta means dark skinned. It can be a term of endearment or an insult -depends on who you ask and who's saying it and a few other things. Meanwhile, Emma from New Mexico, one of my fellow delegates to the WMW Americas Region Encuentro, landed in the Mexico City airport. She went through the “Extranjeros” line, got to the other side, and was having a horrible time navigating through the airport to get to the departure gate for her next flight to Lima, Peru. Later hearing her account of the ordeal, I was struck when she talked about how one person told her, “You’re in Mexico now. We speak Spanish here”. Emma and i arrived in the Lima airport and came out to see Helena’s bright smiling face, her hand waving us over. A man next to her awaiting a loved one or a colleague or who knows who, smiled at us and unlatched the cord to let us cut through. We thanked him and turned and saw a man waving the purple Marcha Mundial de la Mujer/ World March of Women flag. We said hello and followed our taxi driver to his cab. We loaded up and took off into a super busy, smoggy city that looked a lot like Mexico City and Tunis to me. It’s so striking to me how similar cities so far apart look. 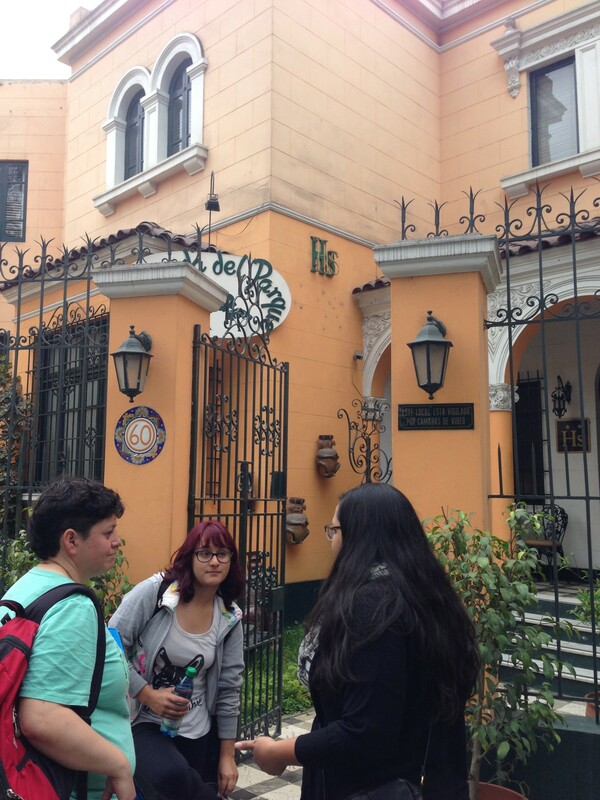 While in Lima, we met the delegation from Chile -Rebecca, Angelica and Mafalda. We had time before we would board a long bus ride to our final destination, Cajamarca, Peru where our meetings would be held. The women from Chile had spent a whole day there and had spotted a market earlier. They invited us to join them to check it out. Rebecca and Angelica spoke Spanish and English. So, we all communicated easily and were soon joking and just starting to loosen up when it happened. Out of the blue, Angelica casually called us, “gringas”. We were shocked, offended, and stricken with grief and hurt. i’ve been called gringa before by my Mexican family. So, while I wasn’t as surprised as my colleagues, it still stung. Angelica was surprised by our reaction. She assured us she didn’t mean any insult and tried to make it become a little joke later, throughout the gathering. It never quite took –it had really struck a nerve with us. We are women of color, who twist our bodies and souls in efforts to dismantle systems that sustain the empire that is the US, to find ways to cripple capitalism, and to put an end to patriarchy from the bottom up. We work hard to stop racism and we were just called, of all things, “gringas”. Overnight, we were bussed from Lima to Cajamarca and that was an experience all its own. We were ALL in a unified state of shock with the luxury we were treated to on a double-decker bus with cushioned seats the size of small beds, foot rests, and plasma screens that showing the worst u.s. based cinema. As I contemplated access to luxury in the US and access to luxury elsewhere, I drifted off and slept through most of a night of winding and close turns through deep cuts to Peru’s mountains. I remembered my anxiety as a child looking through the window of our van as we spiraled up and down through similar cuts to Mexico’s mountains. 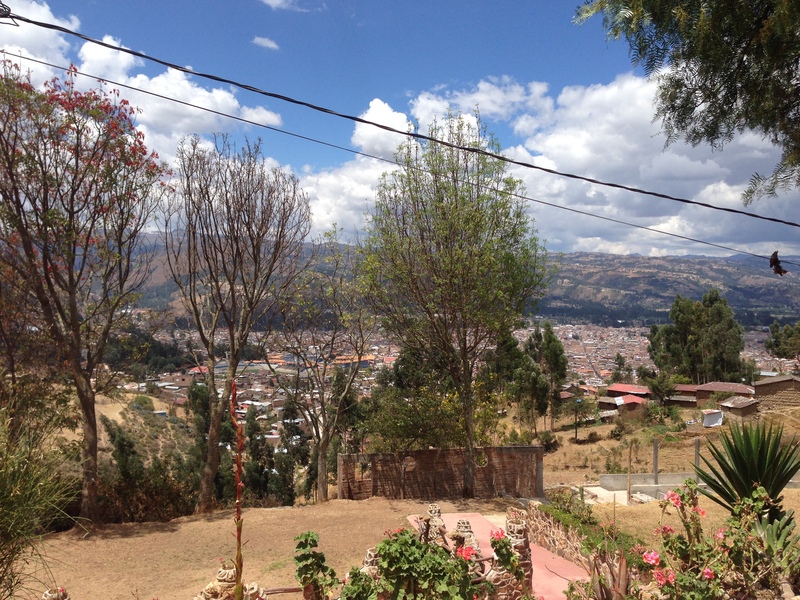 We arrived in Cajamarca, Peru and as we bussed through that city, it looked exactly like Oaxaca, Mexico to me. There was writing on many historic walls just as I had seen in Oaxaca a year after the 2006 teachers and pueblos strikes and resistance in their zócalo, main plaza. 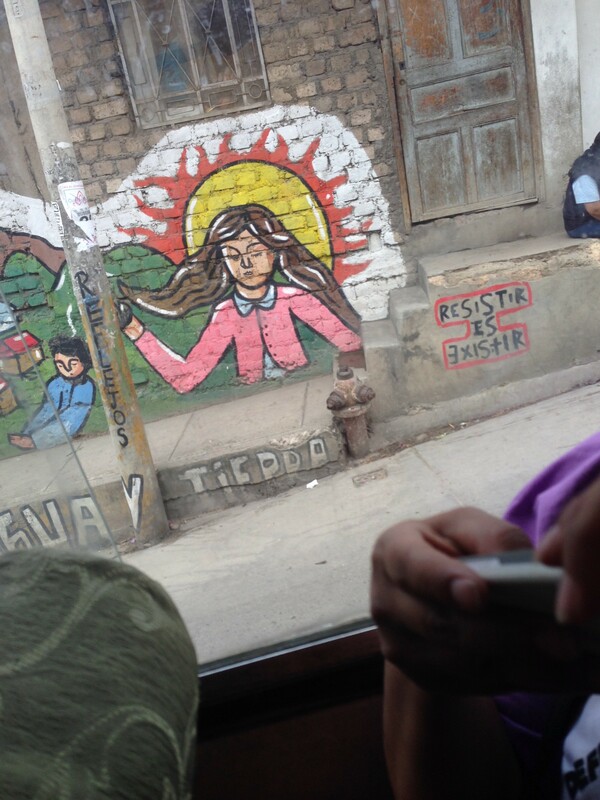 I snapped a foto of a phrase that said “existir es resistir”, to exist is to resist. I’ve considered this phrase in convos with peeps in the US and how this declaration lands here; how it lands in various lands throughout the United States…. As I moved through another land and my thoughts, I remembered that I was just called a gringa several hours ago. We relate the term to white supremacy. Later, as we talked further with Angelica and others, they told us that the general sentiment south of the Mexico/US border is that gringa/o is simply everyone who lives north of that border. It’s a pretty old term. Various generations of “gringas” and those who call “gringas” so have various takes on it. Angelica engaged in deep, separate conversations with Emma from New Mexico and me from Texsas, on borderlands, race, race identity, queer and feminist theory and liberation and the writings of Gloria Anzaldua, Beatriz Preciado and others. Angelica shared about her own struggles of identity, as the daughter of a Mapuche woman and a German father, and having light skin. She told me, people like her are referred to as the “champurria”. It’s a derogatory term that is being reclaimed by some, similarly to the word “queer”, she explained. Throughout the general assembly, the word heteronormativity was used often and showed up on almost all report backs from group work. Capitalism and patriarchy were also often listed as systems of oppression we must continue to resist and work to end. Racism was not listed as often, but came up indirectly through scattered references to the impacts of various oppressions on women of indigenous and rural communities throughout this continent. Coming from the US south, Emma and I talked a lot about feeling a deep sense of connection with the struggles and complexities of struggles that communities represented at the gathering are moving through. Our common struggles include assaults on Mother Earth by extractive industries like mining and fracking and not only their ripple effects but additional impacts on women, rural, indigenous and low-income communities. We recognize their ongoing challenges of gaining access to information and to decision-making processes as our own in our communities in New Mexico and Texas. Relatedly, we also see issues of language justice permeate resistance throughout the Americas. 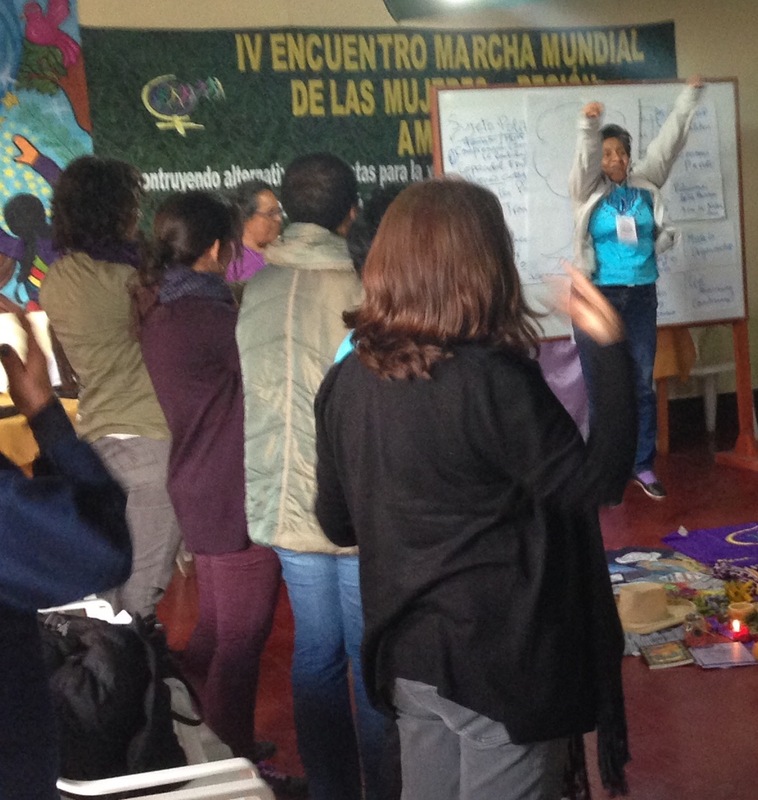 Other spaces of common struggle we identified included cultural aspects of working for reproductive rights, the timeless challenges of intra-communal conflicts, and the constant strain of limited capacity and limited financial resources. Our US delegation, including Maria Poblet and her son Diego, and her partner Josh, and Helena Wong, Emma Sandoval and myself, met a few times throughout the gathering to share our perspectives on things and build our collective assessments. We checked our role as a US delegation and all the identities we hold as such (north american, women of color, queer women, US southern communities and more) within this continent-wide gathering. The lodge where we stayed had a beautiful view and we agreed it was a nice place for an encuentro. As a language interpreter, I would communicate encuentro as a space, place or time where one encounters, finds and/or (re)connects. I returned to the US. grateful for the opportunity to search so far deep and south and to find in the company of Emma, Helena, Maria, Diego, Josh and all the mujeres fuertes, the strong women that came together for the Regional Meeting of the Americas of the World March of Women. PODER is a grassroots, environmental justice organization based in San Francisco’s Mission District.